A new publication will help land and wildlife managers, decision-makers, industry and the public better understand the context of mitigation for energy development's impacts on wildlife. "Natural Gas Development and Wildlife Mitigation: A Primer" is now available from the Ruckelshaus Institute of Environment and Natural Resources at the University of Wyoming. This first publication of the institute's new Energy Mitigation Research and Outreach Initiative provides a common foundation of terms and understanding for what "mitigation" and its associated activities mean in the context of natural gas development in Wyoming, says Anne Jakle, interim assistant director of the Ruckelshaus Institute and author of the primer. The publication is meant to help land and wildlife managers, decision-makers, industry and the public better understand the context of mitigation for energy development's impacts on wildlife. Download the primer at www.uwyo.edu/enr or request a hard copy by calling (307) 766-5080. "As more natural gas projects are considered in Wyoming and across the West, productive conversations about future wildlife mitigation will require a shared understanding of mitigation terminology and practices," Jakle says. One model using Bureau of Land Management data predicts oil and gas development will directly impact 5.7 million acres in the Intermountain West in the next 20 years, with more than 100,000 new wells anticipated. In addition, there are up to 7,500 megawatts of new wind energy projects proposed in Wyoming. 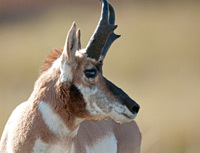 As energy development expands, habitat for species -- including mule deer, pronghorn, sage grouse and other species of conservation concern -- faces disturbance, conversion and fragmentation. "While Wyoming has led the field with innovative mitigation strategies such as off-site mitigation funds in the Upper Green River Basin, there is still uncertainty as to how mitigation should be practiced or how to quantify its effectiveness," Jakle says "With its abundant energy resources and wildlife habitat, Wyoming has the opportunity to lead the country in effective wildlife mitigation practices and set a standard for the rest of the Intermountain West to follow." The Ruckelshaus Institute's new Energy Mitigation Initiative is an effort to gather, synthesize and deliver information on mitigation practices intended to improve consequences to wildlife from landscape-scale energy development. "Natural Gas Development and Wildlife Mitigation" provides definitions of key terminology, a description of where and how mitigation planning can fit into a development project and an overview of emerging approaches for wildlife mitigation. A second primer, "Wind Energy Development and Wildlife Mitigation," is scheduled for release later this summer. The Ruckelshaus Institute of Environment and Natural Resources advances the understanding and resolution of complex environmental challenges through interdisciplinary research, outreach and education. For more information, contact Emilene Ostlind at (307) 766-2604 or email emilene@uwyo.edu. Hear Ruckelshaus Institute Interim Assistant Director Ann Jakle explain the new primer’s importance in mitigating energy development’s impact on wildlife.